San Marino Tennis Center is nestled among the beautiful trees of Lacy Park, located in San Marino, CA. The Tennis Center runs the programs and events that are supported by the San Marino Tennis Foundation (SMTF), a non-profit corporation whose mission is to promote tennis as a recreational activity in the community. The San Marino Tennis Foundation, with enthusiasm and support from the community, was established in 1968 to oversee and operate the facilities which include six championship tennis courts, a pro shop, and locker rooms. The courts are open to the public for a daily use fee. Full-time professionals are available for individual instruction and group clinics for both adults and juniors at all levels of play. In 2005, the San Marino Tennis Club was designated as the official operating name, in lieu of the San Marino Tennis Foundation, though both names are legal. What is at the Facility? The San Marino Tennis Center has 6 championship courts with lights on 3 courts for night play. The Pro Shop offers a selection of tennis rackets, strings, gear, and snacks, with adjacent changing rooms and showers. There is free wifi throughout. For more information on tennis clinics and lessons, go to the Programs page. For more information on services provided at the Pro Shop and merchandise on hand, go to the Services page. 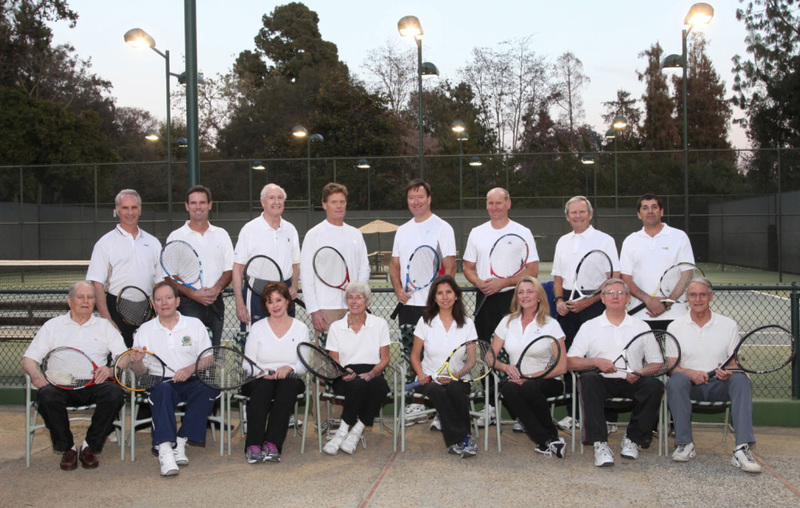 Members of the San Marino Tennis Foundation and immediate family members living in the same household have unlimited use of the courts for free, provided they are members in good standing. Non-members and the public can play for a daily use fee of $10 per person. Please go to the Membership page for more information about becoming a member. "Founding Mothers" of the SMTF, 1969. Do not underestimate the work of mothers! In 1967, three San Marino mothers saw a need for more tennis courts in the community when they started an afternoon tennis program at Huntington Middle School. The mothers, Char Wachtel, Frannie Brossy, and Susie Trotter, recognized the futility in organizing over one hundred eager students on the three tennis courts at the school campus. Through their effort, support from the community, and the help of Stan Clark, a former NCAA Tennis Champion and local attorney, the San Marino Tennis Foundation was incorporated the following year. The new courts were sited on the northwest corner of Lacy Park, at the time a vacant area that was not integrated with the rest of the park. The San Marino City Council approved and signed the concession agreement on June 26,1968. Only residents of the San Marino school district can be members, but the courts are available to all for a daily fee. Under superb leadership of Don Scott, Chair of the Building Committee, the land was graded, the courts were laid in a perfect angle to the sun and the Pro Shop was built from local resident, Bob Millsap's, design. Opening Day was Saturday, June 14, 1969. The original 200+ San Marino families who supported the construction donated the courts to the City of San Marino. The Foundation, however, still operates and maintains the facilities to this day. More details of the history of San Marino Tennis Foundation can be found on the San Marino Historical Society's newsletter, The Grapevine. Change comes slowly in San Marino, and the Lights@Lacy project was no exception. Tennis players, young and old, in San Marino had long been seeking greater access to lighted courts. Through eight years of continuous effort, the San Marino Tennis Foundation made this a reality. Starting in 2004, the local Foundation began its quest to bring about lights on three (of the six) courts. The City Council voted 5-0 for lighting in 2010. This project was completed in December 2012. The entire expenditure was paid for from an accumulation of membership fees and dues over this 8 year period. The Foundation is comprised of some 220 San Marino member families. There were no appeals for naming rights, nor special assessments, fund-raisers, bake sales or car washes to pay for the lights. The genesis of this project was simply to extend the hours of play during winter months to equate to play during summer months - 8:30 pm. The three eastern-most courts were chosen to be lighted as they are the farthest from the most-neighboring homes. These lights, if courts are in use, are set to automatically turn off at 8:30 pm. Exit lights turn off at 8:45 pm. Lighted tennis courts in residential areas limit play to 10 pm. While the lights have extended winter play benefitting the Foundation membership and guests, they have also extended the use of these courts for the entire San Marino community. As part of the scope of this tennis lighting project, additional lighting for the Scout House parking lot was also identified for safety purposes. The Foundation added three lights on posts in the parking lot for the benefit of tennis players as well as evening users of the Scout House complex. The San Marino Tennis Club is a community asset which offers extensive youth and adult tennis programs and tournaments. The facility is admired by tennis players throughout Southern California for its immaculate courts (washed down once a week), mature tree environment, and quiet, peaceful natural setting. The Foundation is indeed grateful for the commitment of many for making this idea of extended play a reality. Our gratitude is extended to the current City Council as well as present and past staff of the City. Of particular dedication and worthy of note are Foundation members Bill Payne, John Lucas, John Rossiter, Charlie Perry, Louise Nixon, Kelly Ryan, Ruth Roberts, and tennis pro, Sam Lizzul. 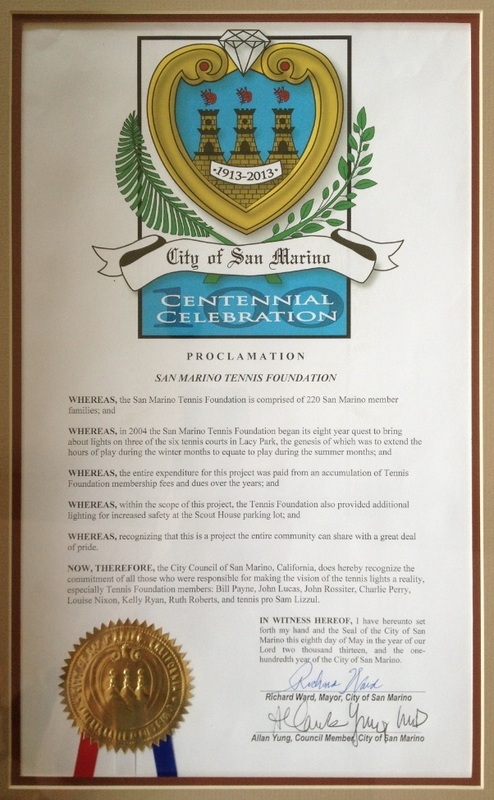 Proclamation Presentation on May 8, 2013 by the City of San Marino to the San Marino Tennis Foundation lauding the membership for bringing to reality the vision of lighting the tennis courts and Scout House parking lot at Lacy Park. (Left to Right) John Lucas, Roger Johnson, William Payne, John Rossiter, Mayor Richard Ward, Ruth Roberts, Robert Wicke, Charlie Perry, and Wayne Carter. Sitting, left to right: John Rossiter, Wayne Carter, Laurie Zeh, Sandy Bode, Ruth Roberts, Lainnie Capouya, Bill Payne, Roger Johnson. Back row, left to right: Chuck Kreindler, Pete Lahey, Ben Hammond, Chuck Perry, Ray Wells, Bob Wicke, Mike Blaylock, Mustapha Baha. Mrs. John W. Austin, Jr.
Mr. Burnell H. DeVos, Jr.
Mr. Thornton H. Hamlin, Jr.
Mr. William L. Hildeburn, Jr.
Dr. George L. Mulfinger, M.D.